Many explorers have made their own maps during or after their trips, some of them made by the necessity to orient one self, other made to document and report on the journey. CAIRN art center proposes to explore the map as an art work resulting from the physical experience of walking, through Jean-Jacques Rullier’s drawings. 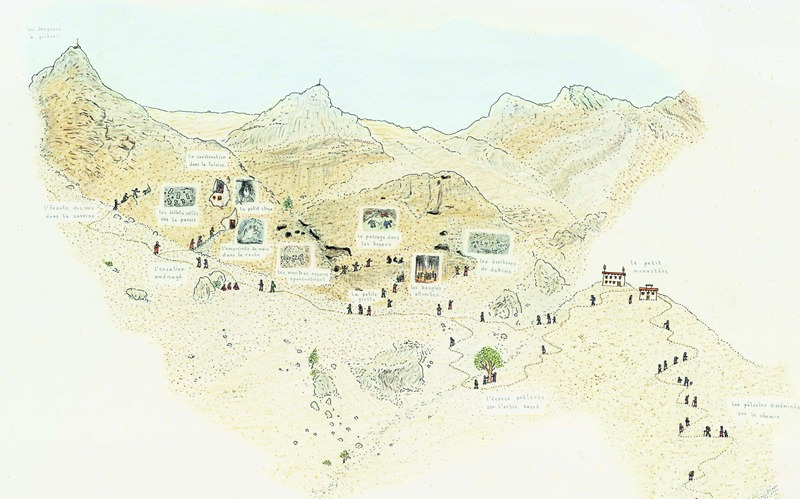 The artist’s drawings trace his walks in Himalaya and India. His physical and spiritual paths convene symbols and iconography from the explored land its self. Drawings will be put in relation with maps of Alexandra David Néel, oriental explorer. During the 20’s she faced the challenge to enter the forbidden city of Lhassa creating her own maps, her house and archives have been donated to the city of Digne-les-Bains. When can a map be considered as a piece of art? This exhibition is included in the project « Marches, démarches » driven by FRAC Provence-Alpes-Côte d’Azur, in partnership with Concrete Art exhibition space, in Mouans-Sartoux, and Le laboratoire, in Grenoble, meant to impulse a new dynamic on a regional scale. By multiple projects, this event proposes to gather around walking, numerous cultural, associative, or educative actors installed on the territory, including rural areas isolated from the cultural offer. Jean-Jacques Rullier, Pilgrimage to the holy caves, 1999. Jean Jacques Rullier born in 1962, in Bourg-Saint-Maurice, lives and works in Paris. Fascinated by the fragment’s vertigo and by an encyclopaedist temptation, attracted by the voyage as a space for privileged experiences, his trips create series of pictures, drawings and installations resulting in books and artist editions. His taste for frontier locations guides him towards his researchs at the crossroads of anthropology, scientific investigations, cartography, traveler’s stories and poetic reverie.